The 'Cape St George' has been named during a ceremony held at Austal’s Henderson shipyard in Western Australia. Cape St George is the first of eight new boats being built by Austal for the Australian Customs and Border Protection Service under a design, construct and in-service support contract valued at approximately A$330 million. 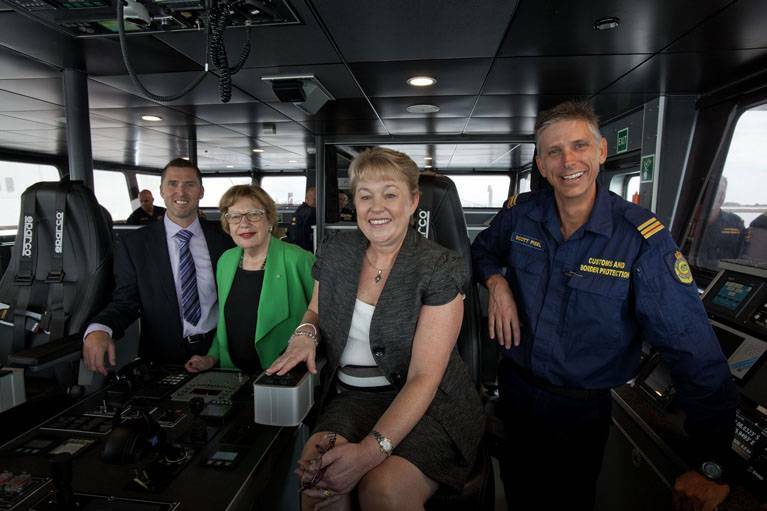 In the picture: Graham Backhouse, General Manager, Henderson Shipyard Operations, Austal; Margaret Reid, Cape St George Naming Lady; Marion Grant, Deputy CEO - Border Management, Australian Customs and Border Protection Service; and Scott Pisel, Commanding Officer, Cape St George on the patrol boat's bridge.